In heating mode, air is discharged directly at low velocity. No ductworks is required so installed cost is lower. Power burner features direct spark ignition, on-off, high-low, and modulating controls. The Air Turnover System picks up the air at the floor, where it is the coolest, then heats and returns it to the space above. Innovative low velocity, low horsepower propeller fans gently turn over the room air 1 to 3 times each hour to maintain uniform temperatures from floor to ceiling throughout the building. Cold air from open doors in shipping and receiving areas becomes less of a problem with an Air Turnover unit. Temperature recovery is almost instantaneous after the doors are closed. The Air Turnover System picks up air at the floor then cools and returns it to the space above. A comfort zone is created from the unit discharge down to the floor level. 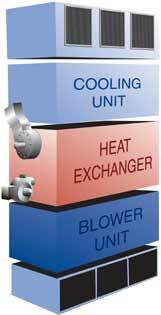 For buildings requiring cooling from floor to ceiling, extensions are available to get the unit discharge to required height. The centrifugal fans quietly move large volumes of air, turning over the air in the comfort zone 3.5 to 5 times each hour. In a building with high ceilings, such as a warehouse or manufacturing facility, thermal barriers are established as warm air rises and gets trapped at the ceiling. The result, known as "air stratification," creates layers of temperature in the space. The temperature at the ceiling may be 25 degrees hotter than at the floor, and the heat trapped at the higher level is unusable. Since the desired building temperature must be maintained at a low level, the inevitable result is excessive heating bills. Air stratification also creates problems in spaces that require cooling. Because cool air settles to the floor, higher levels remain too warm. When the temperature is not uniform from floor to ceiling, condensation can form causing moisture damage. An Air Turnover system solves the air stratification problem by continuously circulating the air in the space. It picks up air at the floor, removing the coldest air layer supporting the thermal barrier. The air is heated or cooled, and returned quietly through a screened discharge plenum to create a uniform temperature and a comfortable, more cost-effective conditioned space. Fuel is conserved by utilizing heat normally trapped at the ceiling. Electrical operating costs can be reduced as much as 40% with low horsepower, high efficiency propeller fans. Quiet, warm weather ventilation is available with low power consumption. Condensation that might form on stored materials is eliminated. Moisture damage is minimized through constant air circulation and uniform room temperature. Installation cost is low because no duct distribution system is needed. The availability of large units also means fewer fuel and vent connections. Easy to reach controls and burner on floor mounted equipment simplify maintenance. Flame safeguard reliability provides safe operation. Electronic programming control monitors the firing sequence. Temperature recovery is rapid. The cold air effect from open shipping and receiving area doors is quickly overcome after doors are closed. Systems for heating only or heating/cooling. All systems also provide quiet, warm weather ventilation. Heating and cooling costs reduced up to 40%. Quiet, draft-free operation with low power consumption. No duct distribution system reduces installed cost. Large and small units to meet every need. Condensation and moisture damage eliminated. Floor mounted controls and burner simplify maintenance.